These days, I am all for choker necklaces! They look absolutely stylish and stunning and do not choke your neck *laughs*. I had already featured a lace choker that I ordered from Zaful HERE. 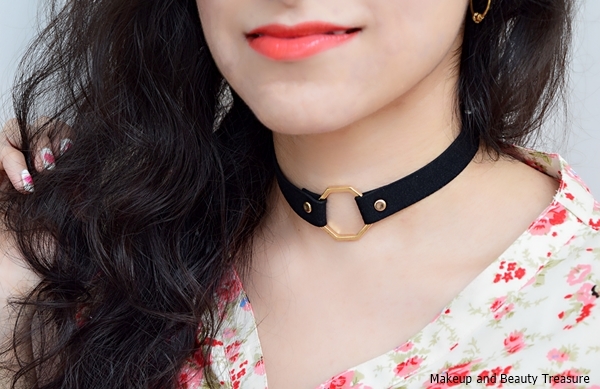 Today I am going to show you a set of leather choker necklaces* with a velvet finish! The set consists of 2 choker necklaces! One has golden studs all over it, whereas the other has a shape of an octagon! The set has to be worn together but literally I do not feel comfortable wearing both the necklaces together so I wear it separately according to my outfit. The choker necklace is made of leather material with a velvet finish! It feels soft and comfortable against the skin. There is a loop chain so you can adjust according to your convenience! I have worn these necklaces many times and have not seen any signs of wear and tear! Though the necklaces are made of leather material but they do not make me sweat. I am not sure how they will flare in the summer season! It is pretty good weather in Hyderabad! Zaful provides worldwide shipping! My order reached me safely and I was not charged with custom duty! Do you like choker necklaces? The choker looks beautiful on you.